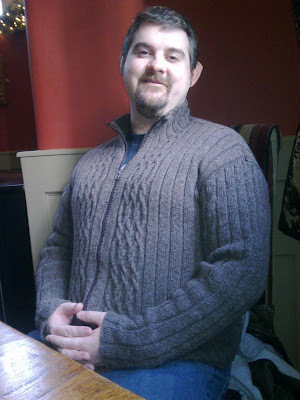 I can now finally show you the completed cardigan I made for my brother for Christmas. It was a close run thing as to whether it would get finished in time or not, but I am pleased with how it all worked out. I got a photo via email from my SIL today and here is my baby bro wearing his brand new cardigan. Apparently he has worn it constantly all week and it will have to be pried off him for washing. There is no greater compliment for a knitter than that I think. The pattern is Nevis by Marie Wallin and it was originally intended to be knitted in Rowan Tapestry which is a self striping yarn, in three different colours. There was no way my brother would ever wear anything that vibrant, so when my SIL came to visit in the summer we snuck out to Mary Clare. We ordered some Sirdar Denim Tweed DK, which is a practical yarn that is machine washable, slightly less dense than the Tapestry, which means the finished garment can be worn for more of the year and significantly cheaper (shhhh don't tell the brother!) The yarn was paid for by my SIL and she was involved in the selection of the pattern, i.e. she said yes when I showed her what I wanted to do. I am proud of this knit as it is probably the biggest and most complex item I've made to date and it is being enjoyed by one of my favorite people. I'm glad I have this knit to show you this week as I have been unable to craft much of anything else at all. I have had a nightmare of a cold and have barely slept longer than 2 hours in a stretch all week. Hopefully one day it will go away and I can think of knitting something other than garter stitch dishcloths once more. However I have been kept pretty busy learning how my new iPod Touch works. It was a Christmas present using money from my OH, my Dad and from me to me. I LOVE it, but I am still getting to grips with it. However there is nothing better in the middle of the night when you are feeling wobbly than watching BBC programmes on the iPlayer. For that alone I am grateful to my new toy! By the way, if any of you have any essential apps that you love to use, please let me know as I am gradually building up a collection.